Advance LA’s 2014 Conference, titled RESILIENCE, presented cutting edge research and interventions that focused on easing this transition process. 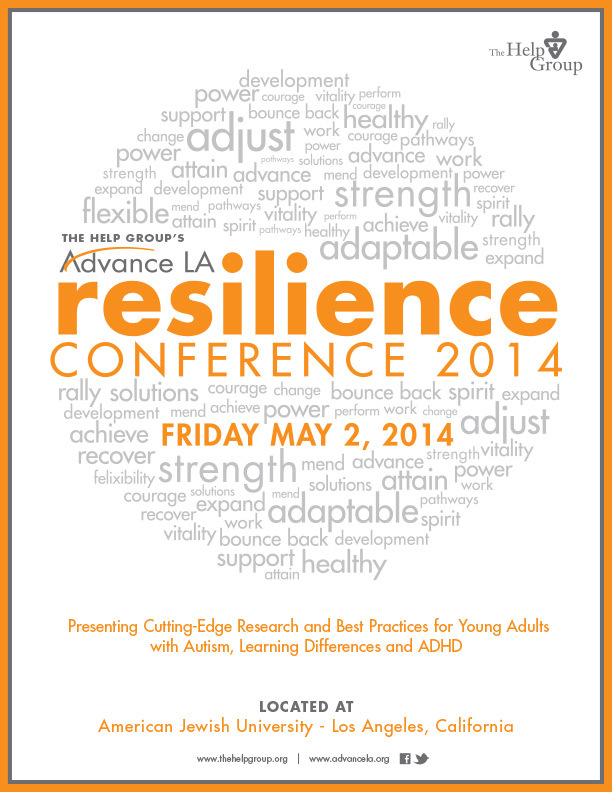 The Resilience Conference was held at American Jewish University on Friday, May 2nd, 2014. Preparing young adults with autism spectrum disorder, learning disabilities, Asperger’s Disorder, executive functioning challenges, and other social or emotional issues to transition to college, the workforce, and beyond, can be challenging for both the young person, their family and professionals working with them. Advance LA, a program of The Help Group, specializes in preparing young adults for a successful future. Attendees this attended workshops that touched on mindfulness, learning how to thrive with ADHD, the latest research in pharmaceutical management for young adults, transitioning to independence and employment, sexuality education and many more topics of interest. The Help Group’s Advance LA Resilience Conference 2014, presenting cutting edge research and best practices for young adults with autism, learning differences and ADHD, was held on Friday, May 2nd at American Jewish University in Los Angeles. The Conference featured 14 nationally prominent experts who focus their research and practices on how best to support young people with learning differences, autism and ADHD in their transition to college, the workplace and beyond. “Our goal is to spark dialogue amongst parents and professionals by presenting research and interventions that support the young person’s ability to be resilient and develop the inner strength needed to maximize their potential,” Jill Rosenberg, Director of Advance LA. Experts included Keynote Speaker, Dr. Andrew Shatté and presenters Dr. James McCracken, Dr. Peter Gerhardt , Erica R. Holding, BCBA-D, Dr. Elisha Goldstein, Dr. Stefanie Goldstein, Dr. Craig Surman, Dr. Carol Schall, Dr. Vicki Zakrzewski, Dr. Mark Katz, Dr. Jane Thierfeld Brown, Dr. Amy-Jane Griffiths, Dr. Sarita Freedman and Dr. Lindsey Sterling. The Luncheon Program honored Nancy Rosenfelt with The 2014 Advancing Awareness Award in recognition of her longstanding and heartfelt dedication and commitment to students with learning differences as Director of Summit View Schools, and Rabbi Naomi Levy with The 2014 Resilience Award for her message of hope and resilience as described in her book, Hope Will Find You. The Help Group’s Advance LA is dedicated to providing resources, support and training to teens and young adults with their transitional living program, one-on-one coaching, parent groups, and social clubs. For more information on Advance LA, workshop descriptions, registration and sponsorship opportunities, please visit www.advancela.org or call 818-779-5198. The Help Group’s nine specialized day schools offer pre-K through high school programs for more than 1,500 students. Its broad range of mental health and therapy services, child abuse and residential programs extends its reach to more than 6,000 children and their families each year. With more than 950 staff members, The Help Group’s state-of-the-art schools and programs are located on seven campuses in the Los Angeles area.